+50 job-offers from all over the world. A marriage proposal via Twitter. 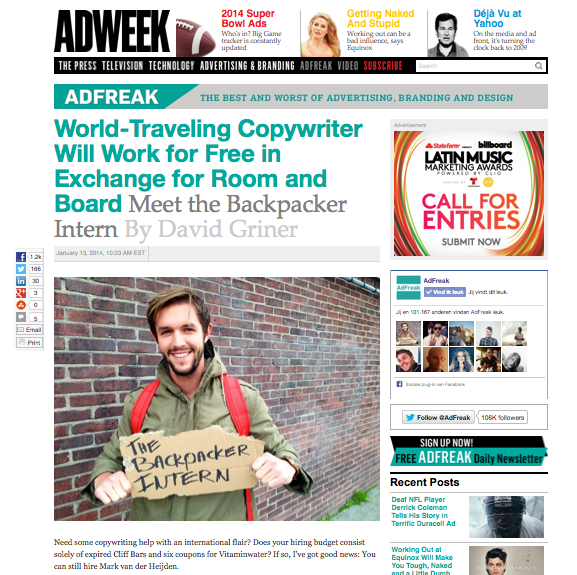 And a feature on one of the biggest advertising blogs in the world: Adweek. Not bad for day 1. Thanks everybody for all the messages via Twitter/Facebook/Email/Website. Sorry if I didn’t reply to you yet. Since I’m traveling it could take some days before I’m able to respond. So grab some beers, chill and before you know it…*BOOM* you’ve got a reply. I wish you all the best from sunny Thailand. If you are, just email me back. I’d love to talk to you and bring you around! Where are you staying today and how long will you travel in Thailand? Wish you had a great time here! Cheers! wish you enjoy traveling in Bangkok. You should go to the Grand Palace or Wat Pho, I think it’s the great landmark of Thaland, very very beautiful. i’m glad that you chose my country to travel. You are my idol ! Wish you have a good trip in Bangkok. Beware yourselves from politic conflict. wish you good luck and fun on your trip. i read your story from brand buffet and i admire you and your passion a lot! Very cool idea !! I could say that you can inspired to many people out of the frame. Have a nice trip. Hope you an awesome journey! hi，man，hope you have a good time in Thailand,thats a amazing country.BTW,I am live in beijing ,hope you will be here one day. looking forward to see you and share some interseting things with us.if you need any help when you are in china,pls let me know.good luck! Hey, Will you come to China-Beijing? I would like to offer you a content copy work.